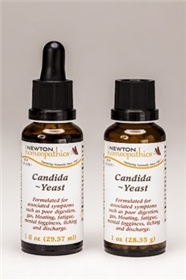 Candida albicans is yeast that is normally present in the colon without causing problems. When a person becomes weak or sick, the yeast becomes over active and may invade organs such as the small intestine, the female organs, the urinary tract, and the mouth and throat. Because a yeast imbalance can only arise when the body’s defenses are undermined by diminished enzyme function and reduced general vitality, it is wise to find out why the yeast is invading these organs or causing symptoms. It may be caused by an overburdened liver unable to eliminate toxins fast enough or a lack of essential vitamins, minerals, and trace minerals due to chemically-grown food in depleted soils. If the diet is too rich in protein, too much urea and uric acid are produced for the liver to adequately convert into disposable wastes. Use Candida to relieve symptoms of a yeast imbalance such as bloating, weakness, foggy head, and vaginal discharge. Directions: Take 3 to 6 drops on the tongue every day before breakfast and repeat in the afternoon around 4:00 PM, or before dinner, depending on which time of the day the symptoms are worse. If accompanied by long-standing intestinal problems, consider adding Bowel Discomfort complex. If accompanied by joint and muscle pain, add the Rheumatic Pain formula every day. If vaginal itching is a problem, try the Feminine Itching complex. Improvement is usually seen in a few weeks, but complete restoration of vitality may take from 3 to 6 months. Avoid refined carbohydrates such as sugar or white bread to facilitate effectiveness. Continue one dose daily for a week after cessation of symptoms. Candida and FeminineItching complexes are also helpful after antibiotic treatment. Ingredients: Candida albicans 12x. Antimonium crudum, Arsenicum album, Baptisia tinctoria, China,Hydrastis canadensis, Iodium, Kali carbonicum, Lachesis mutus, Lycopodium clavatum, Mercurius vivus,Natrum carbonicum, Podophyllinum, Pulsatilla 10x. Althaea officinalis, Berberis aquifolium, Echinaceapurpurea, Ginkgo biloba, Iris versicolor, Juglans regia, Lappa major (Arctium lappa), Thuja occidentalis 3x. Alcohol 20%.